Milind Pai- Architects and Interior Designers which is a highly professional, well established firm since 1987 and specializing in various spheres of design from Private Architecture to Corporate office, Residential, Retail, Hospitality, Institutional and Health Care Interiors. Our firm is currently at its 28th Year of existence! We bring into the industry the latest in trends and technology that gives an added edge to our clients when they hire our services. Our designs and presentations are done on latest 3D software and the quality and finishing on the site is given the highest priority. Our projects are widely covered by Design Magazines and professionally our firm is very well known for quality of designs we produce. We provide architectural and interior design for Advisory Practice, Cultural Centres, Aviation, Convention Centres, Corporate offices, Education, Government, health, hospitality, Interiors, Mission Critical, Mixed use, Residential, Science and technology, Sports and Entertainment, Urban Design, institutional and corporate projects. Since inception in 2007 we completed over 100 and counting renovations, new constructions, designs and project management projects. No one can live in a drawing; hence we strive for the durable and tangible build form of a design. For us durability is created by thorough analysis of the client's requirements, meticulous detailing and keeping the lifespan of the design in mind with the required maintenance over many years. 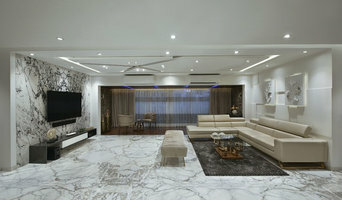 We are specialized for Residential Interior Designers in Mumbai, Residential Interior Designers in Pune, Residential Interior Designers in India, Commercial Interior Designers in Mumbai, Commercial Interior Designers in Pune, Commercial Interior Designers in India, Architects in India, Architect in Pune, Architect in Mumbai, Interior Designers in Mumbai, Interior Designers in Pune, Interior Designers India. At our soul and in our daily practice, we are a service company. Our vast suite of capabilities allows us to intersect with one another, involve experts at every level, include our clients’ visions and improve each project we touch. A place is not merely a structure. It is a living, breathing element that resides in a larger environment, and must exist in a community and improve the experience of those who use it – as well as those who never will. Below is a brief description of our services. anjali rawat architects is a young design consultancy firm with a vast experience in the field on architecture and interior designing. With projects spread across India with strong presence in Mumbai. 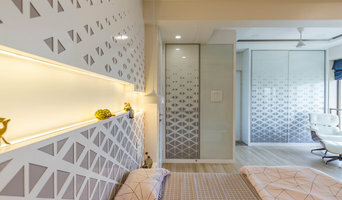 Nitido Design is a reputed Mumbai-based turnkey interior design and architectural practice known for its thoughtful approach to design, detailing, and finishing quality. Using the finest of materials, the latest in innovations, and the most precise craftsmanship, we deliver projects that are designed to exceed your expectations. Founded by Sameer Balvally and Shilpa Jain Balvally with an aim to transform quality of lifestyle through the spaces they design, be it interior or architecture, the firm beautifully balances their youthful enthusiasm with experience gathered by working with clients from all realms. The Studio’s foundation is based on the genesis of the ‘Osmosis’ phenomenon by absorbing the individual needs of the client, working cohesively on the design and collaboratively arriving at a solution which is not only creative but also tangible and sustainable. Studio Osmosis believes in absorbing the individual needs of the client, working cohesively on the design and collaboratively arriving at a solution which is not only creative but also tangible and sustainable. All designs at the Studio are based on research and experimentation with adaptability as the key factor. While Studio Osmosis has a contemporary and flexible approach towards design and technology, they derive inspiration from various walks of life, art, culture, history and people. It is a Studio where young minds work together; ideas are born, nurtured and streamlined to offer the perfect service and a superior product to the client. It is a firm where professionals enjoy what they do; building relationships. From big entrepreneur homes to hippest of restaurants, Studio Osmosis in its 7 year journey has transformed spaces with a knack for providing that X factor that makes them stand apart from the rest. Even homes as small as 450 sft elude empathy, and pent houses transform into cozy spaces where the families enjoy interacting with each other. Every office designed by Studio Osmosis has at least one element of design that leave an impression in the mind of the visitor while for their fantastic restaurant designs the only testimony is repeat customers. Studio Osmosis is currently working on numerous architecture, interior design and master planning projects. We have worked on various Hospitality, Commercial, Residential, healthcare projects in various Indian cities as well as abroad. SHROFFLEÓN IS A FULL SERVICE DESIGN FIRM OFFERING COMPREHENSIVE ARCHITECTURAL, PLANNING AND CONSULTANCY SERVICES TO CIVIC, MUNICIPAL, INSTITUTIONAL AND PRIVATE CLIENTS. A YOUNG AND DYNAMIC CREATIVE STUDIO WITH A BURGEONING REPUTATION AS A PROFESSIONAL ORGANIZATION KNOWN FOR ITS INNOVATIVE SOLUTIONS, THE PRACTICE THRIVES ON THE ENERGY, ENTHUSIASM AND FRESH THINKING OF A TEAM OF YOUNG ARCHITECTS WHO WORK CLOSELY WITH EXPERIENCED SENIOR MENTORS. THEIR PROJECTS BENEFIT, IN NO SMALL MEASURE, FROM THEIR ASSOCIATION AND COLLABORATION WITH EXPERIENCED STRUCTURAL, LIGHTING, MECHANICAL AND LANDSCAPE CONSULTANTS THAT WORK TOWARDS CREATING A HOLISTIC PROJECT. THE FIRM’S METHODOLOGY IS CHARACTERISED BY A DEEP INQUIRY AND AN INTELLECTUAL COLLABORATIVE EXCHANGE: THE DESIGN WORK BEING INFORMED BY INTENSIVE RESEARCH AND AN EXPERIMENTAL APPROACH. SHROFFLEÓN CONTINUALLY STRIVES TO INVENT AND INNOVATIVE, ENVIRONMENTALLY RESPONSIBLE DESIGN SOLUTIONS WHILST CREATING SPACES THAT ESTABLISH HEALTHY CONNECTIONS; FLUID EXCHANGES BETWEEN INHABITANTS AND THEIR ENVIRONMENTS. THEY TEND TO VIEW EVEN THE MOST DEMANDING AND COMPLEX CLIENT NEEDS AS OPPORTUNITIES TO CREATE TRULY INNOVATIVE ARCHITECTURAL SOLUTIONS -SOLUTIONS THAT ARE INTENDED TO MEET AND HABITUALLY SURPASS CLIENT EXPECTATIONS. THE STRENGTH OF THE STUDIO LIES IN INSPIRED CONCEPTUAL THINKING, BACKED BY THE DEMONSTRATED EXPERIENCE, SKILLS AND TECHNICAL EXPERTISE TO COMPETENTLY TRANSLATE ABSTRACT IDEAS INTO REALITY. THEIR PROJECTS SPAN ACROSS SCALES - FROM LARGE SCALE URBAN PROPOSALS TO SMALL, RESIDENTIAL PROJECTS, ARCHITECTURE INSTALLATIONS OR ARTIFACTS, WITH EACH PROJECT GEARED TOWARDS MAXIMIZING INHERENT LATENT POTENTIAL, PERFORMANCE AND VALUE THROUGH FINE TUNED WORK METHODOLOGIES. ROOTED WITHIN A SINGULAR CONCEPT, EACH PROJECT STARTS WITH A CAREFUL ANALYSIS OF THE SITE AND THE BRIEF. THE PROJECT DEVELOPS IN CONJUNCTION WITH THE CLIENT; THROUGH AN IDENTIFICATION OF THE CONSTRAINTS, OBJECTIVES, POTENTIALS AND MOST IMPORTANTLY, THE BUDGET. THE WORK OF SHROFFLEÓN, INCEPTED IN 2008 IN ITHACA, NEW YORK BY KAYZAD SHROFF AND MARIA LEON HAS BEEN WIDELY PUBLISHED IN LEADING NATIONAL AND INTERNATIONAL ARCHITECTURE, DESIGN AND INTERIOR WEBSITES, BLOGS AND MAGAZINES. THE OFFICE, 302, IS LOCATED WITHIN THE HISTORIC CENTER OF MUMBAI, CHURCHGATE, BOASTING OF A VIEW TO A DIRTY DUCT. THEY ALSO HAVE AN UNTRAINED OFFICE DOG, ADOBE. Studio emergence is a design studio found by two architects, Seeja Sudhakaran and Khushbu Davda, with a penchant for geometry in design and Parametric Design Approach. We are a network of architects & designers specializing in algorithmic & parametric design strategies. We also have a research cell which wherein we collaborate with designers & artists from across the globe. We offer collaboration to different architecture firms looking for parametric consultancy and also provide direct solution to the end users and developers. Providing data driven design solutions and integrating these computation based technology to the existing workflow are one of our strong suits where we strive to increase the overall efficiency of the project. Along with practicing architecture and planning, we also try and create various installations and products based on parametric design. We believe in being hands on when it comes to exploring different fabricating techniques and love to work with all digital fabrication processes. Most of our works are derived from inspirations from nature and Biomimicry or strong geometric forms. Architect Ashiesh Shah began his career in New York City in the mid 2000’s after graduating from the Parsons University with a degree in Interiors and Architecture. For the last eight years, Shah has been spear heading his own design firm Ashiesh Shah Architecture + Design handling various high-end design projects in India and beyond. Shah was titled the Elle Décor Designer of the Year in 2016 and is named one amongst the 50 most influential names in architecture and design in the country by Architectural Digest for four consecutive years 2014, 2015, 2016 and 2017. His projects have been published in the New York Times, World of Interiors, International Herald Tribune, Wallpaper Magazine, Elle Decoration, Architectural Digest, Vogue, Casa Vogue, Condenast Traveller to name a few. A contributing editor at Vogue and Casa Vogue, Shah regularly writes about interiors, art and design for several magazines including Architectural Digest, Condenast Traveler, Telegraph, Hello, HiBlitz and newspapers like DNA, Mumbai Mirror and HT Cafe. A collector of art and design, in 2014, Shah was nominated under the category of the most influential young art collector in the sub continent by Forbes India. Ashiesh considers himself an eclectic collector, whose taste spans centuries and continent. His keen interest in art often informs, inspires and nourishes his practice and perspective. AShah Architects was started in 1994 with a vision for design to be modern and yet be rooted in tradition and sustainability. Over the last two decades the firm has worked on a diverse range of architecture and interior projects of varied scale across residential, retail, institutional and commercial sectors. Each project is dealt with great passion and panache. By a dedicated team that has stayed true to the vision of creating designs that are contextual, and thoughtful keeping in mind the needs of not only the client but also the environment. Our team consists of enthusiastic and highly dynamic designers, who work constantly to push design boundaries, with an obsession for detail and perfection. With the right mix of tradition and international design flavors, the team ensures end user satisfaction. The diversity of projects handled, has given us a wide perspective towards the process of design, execution and interpersonal relationships. We couple the experience and management capabilities of a larger firm with the personal attention and service of a smaller firm. Having completed over 200 projects, we have been featured in most of the leading magazines including Inside Outside, Femina, Society Interiors amongst others. 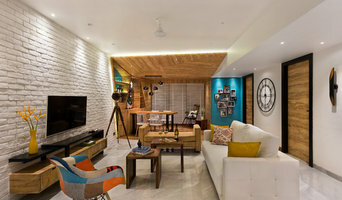 How do I find the best Mumbai architect for my home design or renovation project? When building or renovating your home, you don't simply hire an architect or building designer — you build a relationship with them. Be sure you chose a home architect who will be involved in all phases of the design process, from the initial concept to the completed construction. Architecture is an incredibly technical profession and one where getting things wrong can literally put lives at risk, so ensure you hire a professional with a valid license or an architectural firm to maintain high quality and standards. Your next consideration will be architectural style. Some residential architects specialise in designing traditional homes or farmhouses, others in designing modern replicas of traditional homes. While a few have a knack for imagining bolder, more futuristic architectural design in Mumbai that incorporates the latest technology. How much does hiring an architect in Mumbai cost? Home construction and renovation often have a preset budget and hence it is important to understand how much architects charge. While there is no set payment structure, independent architects may charge differently from architectural firms. Architects sometimes choose to calculate their fees on the basis of a per square foot rate. In rare cases, especially with smaller projects, Mumbai architects may choose to ask their clients for a fixed fee. Make sure the total figure and payment schedule is agreed as part of your contract, particularly if you are trying to accurately estimate the cost of building a house. Find a home architect in Mumbai on Houzz. Narrow your search in the Find Pros section of the website to Mumbai architects. You may also look through photos projects to find building designers in Mumbai who have worked on a project similar to yours.